I said I would do a separate post with my Birthday Loot, so I thought I would post it now since all of my books have arrived. My birthday is not actually until Monday, but since I don't expect to receive any other books there is not much point in waiting. I have to catch-up with Jim Butcher's Storm Front for the R.I.P. Read-Along on Monday, anyway. I bought myself 5 books. There was meant to be at least one more, but I am a bit hesitant about ordering books online at the moment. The mail experiences that I spoke of in my post on Thursday explain why. I don't really need any more books, anyway. I think I have read too many good books lately. It is dulling my reading experience the last couple weeks. 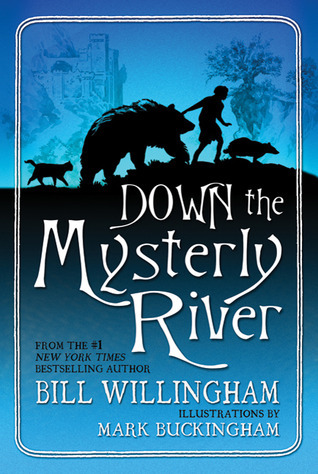 Down the Mysterly River by Bill Willingham - This is an example of my having some issues with my reading lately. I should be done this book by now, but I am really dragging my feet. It is not terrible, but it is nothing like Fables, either. I think I am a bit let down by the experience. 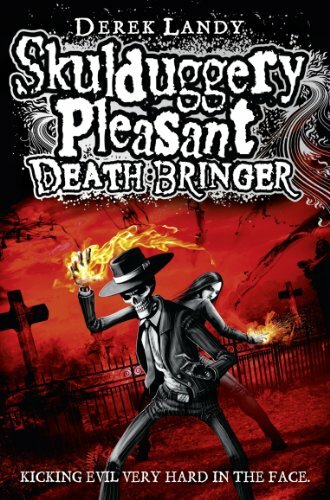 Skulduggery Pleasant: Death Bringer by Derek Landy - This is actually the reason why I wrote the post 'Mail Woes'. It took two weeks for the book to get here and then when it did the package was open. I think of all the books I bought, this is the one I was probably the most excited about. I love this series for some reason. I have started the book and it is fun to visit with old friends. 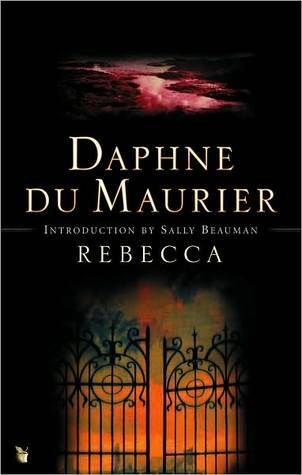 Rebecca by Daphne du Maurier - I read this book finally last year and loved it, so I decided I wanted my own copy. I actually just finished watching the movie... It was actually pretty good! (FYI: You can watch the whole thing on YouTube.) I will probably review it as part of the R.I.P. challenge. I sort of want to buy a book I haven't read by du Maurier, but I think I will reread this one and take it from there. Prince of Thorns: Book One of The Broken Empire by Mark Lawrence - This actually one of the reasons why I am having a hard time getting into books lately. I quite enjoyed this book and am glad that I splurged after knowing very little about it. September may not have been my busiest reading month number-wise, but it is probably the month where most of my best reads came from so far. What a fun bunch of books! That Prince of Thorns makes me want to read it by just the cover alone. Wow! Do have a wonderful birthday on Monday! Happy birthday for Monday! Good haul you've got there too - I've heard good things about Prince of Thorns, I'm looking forward to giving that a shot. That's awesome that you were finally able to watch Rebecca! Such a great adaptation. Eclectic collection! And advanced Birthday wishes! Nice birthday loot! PRINCE OF THORNS especially looks great. And I hope you have a great birthday! I just finished reading and reviewing Rebecca and it was my first time reading it - and I absolutely loved it. I have the cover that looks all romantic (red with the big "R" on it) so I do like your cover much better. I'm primed and ready to watch Rebecca and how fantastic that it's on YouTube! Too bad the Willingham book isn't working for you. I hope to get The Lantern before the read-a-long starts but I'm so far down the holds list, I'm sure I won't get it in time. That's a great list of books! REBECCA is one of my all-time favorite books. THE LANTERN was good. I think you have going to have a great read-along turnout for it. Both are definitely very appropriate for the season. And if I don't get to you tomorrow, happy birthday!! Happy Birthday a day early! Books are always a good gift to receive (and give yourself!). I just pulled out my copy of The Lantern and plan to start reading tonight. And Rebecca is one of my favorite books--definitely worth owning! Happy birthday a day early!! I hope the Lantern readalong goes well. I was supposed to participate if I could get the book on time, but I'm still way back on the hold list and there are very few copies at the library. We'll see if I get it before RIP ends...sigh. I'm looking forward to your thoughts on it! **softdrink: I really like the cover I have. It is the version the library had, so I browsed by ISBN when I went to buy it. I hope you enjoy! **Suey: Prince of Thrones was really good! I am so glad I bought a copy. Thanks for the birthday wishes! **Jamie: Thank you! Prince of Thrones was really good! **Ana: Nope, no worries. :) I loved watching Rebecca. I think they did a very good job and wish I had bought the copy I saw last year. **Eustacia Tan: I love Skulduggery! I am really enjoying it so far! **Li: Thanks! Prince of Thrones was really quite good! **Natalie: That's the cover of Rebecca I had. I bought it because people loved it, but I just couldn't bring myself to read it and decided to try the library instead... I have since passed that copy along to a friend, so I bought this one instead. I look forward to having you join us for The Lantern! **Vasilly: I finished the Willingham book today and I wound up enjoying it more than I did in the beginning. I had The Lantern out from the library back in September, so I knew it wouldn't happen again in time. That's why I bought it. :) I hope you can join in! **Michelle: I loved Rebecca! I am looking forward to The Lantern and the read-along. Thanks for the birthday wishes! **Amanda: Thanks! I hope you get a chance to read The Lantern. I had originally planned to read it through the library, but bought it because I was helping host the read-along and thought it would be a safer bet. @Kailana: Ok, thanks(: I'll go find a copy as soon as my exams are over. Btw, I really love your blog, I'm having so much fun reading through the archives! Oh, um, what's the RIP challenge? I've been seeing it around, but I don't quite get it... Sorry for bother you. Happy birthday!! 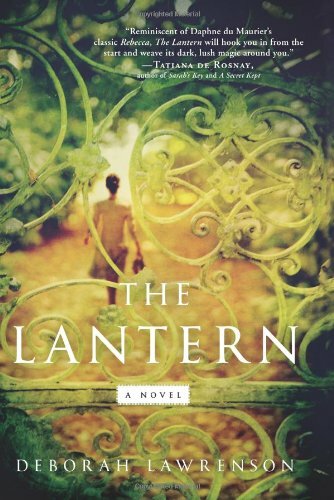 I really want to read Rebecca, and I'm looking forward to your thoughts on The Lantern. **Eustacia Tan: I hope you enjoy it! Thanks! Sometimes I am scared of my archives because the longer I blog, the less I like how I used to blog. If that makes any sense! The R.I.P. Challenge is a challenge hosted at Stainless Steel Droppings where you have fun and read or watch movies that fit into darker categories: dark fantasy, horror, mysteries, etc. The best idea would be to head to the site and browse around there: www.stainlesssteeldroppings.com.